This is “Geography Basics”, section 1.1 from the book Regional Geography of the World: Globalization, People, and Places (v. 1.0). For details on it (including licensing), click here. Understand the focus of geography and the two main branches of the discipline. Learn about the tools geographers use to study the earth’s surface. Summarize the grid system of latitude and longitude and how it relates to seasons and time zones. 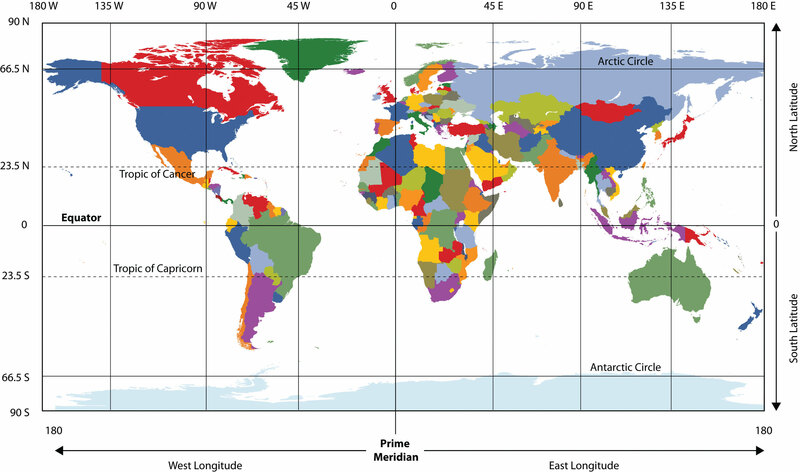 Distinguish between the different types of regional distinctions recognized in geography. Understand the spatial nature of geography and how each place or region is examined, analyzed, and compared with other places or regions. Determine the basic geographic realms and their locations. GeographyThe spatial study of the earth’s surface. is the spatial study of the earth’s surface (from the Greek geo, which means “Earth,” and graphein, which means “to write”). Geographers study the earth’s physical characteristics, its inhabitants and cultures, phenomena such as climate, and the earth’s place within the universe. Geography examines the spatial relationships between all physical and cultural phenomena in the world. Geographers also look at how the earth, its climate, and its landscapes are changing due to cultural intervention. The first known use of the word geography was by Eratosthenes of Cyrene (modern-day Libya in North Africa), an early Greek scholar who lived between 276 and 194 BCE. He devised one of the first systems of longitude and latitude and calculated the earth’s circumference. Additionally, he created one of the first maps of the world based on the available knowledge of the time. Around the same time, many ancient cultures in China, southern Asia, Polynesia, and the Arabian Peninsula also developed maps and navigation systems used in geography and cartography. The discipline of geography can be broken down into two main areas of focus: physical geographyThe spatial study of natural phenomena that make up the earth’s surface. and human geographyThe study of human activity and its relationship to the earth’s surface.. These two main areas are similar in that they both use a spatial perspective, and they both include the study of place and the comparison of one place with another. Physical geography is the spatial study of natural phenomena that make up the environment, such as rivers, mountains, landforms, weather, climate, soils, plants, and any other physical aspects of the earth’s surface. Physical geography focuses on geography as a form of earth science. It tends to emphasize the main physical parts of the earth—the lithosphere (surface layer), the atmosphere (air), the hydrosphere (water), and the biosphere (living organisms)—and the relationships between these parts. Some physical geographers study the earth’s place in the solar system. Others are environmental geographers, part of an emerging field that studies the spatial aspects and cultural perceptions of the natural environment. Environmental geography requires an understanding of both physical and human geography, as well as an understanding of how humans conceptualize their environment and the physical landscape. Physical landscapeThe physical environmental features that make up the earth’s surface. is the term used to describe the natural terrain at any one place on the planet. The natural forces of erosion, weather, tectonic plate action, and water have formed the earth’s physical features. Many US state and national parks attempt to preserve unique physical landscapes for the public to enjoy, such as Yellowstone, Yosemite, and the Grand Canyon. Human geography is the study of human activity and its relationship to the earth’s surface. Human geographers examine the spatial distribution of human populations, religions, languages, ethnicities, political systems, economics, urban dynamics, and other components of human activity. They study patterns of interaction between human cultures and various environments and focus on the causes and consequences of human settlement and distribution over the landscape. While the economic and cultural aspects of humanity are primary focuses of human geography, these aspects cannot be understood without describing the landscape on which economic and cultural activities take place. The cultural landscapePlaces where the earth’s surface has been altered by human activity. is the term used to describe those parts of the earth’s surface that have been altered or created by humans. For example, the urban cultural landscape of a city may include buildings, streets, signs, parking lots, or vehicles, while the rural cultural landscape may include fields, orchards, fences, barns, or farmsteads. Cultural forces unique to a given place—such as religion, language, ethnicity, customs, or heritage—influence the cultural landscape of that place at a given time. The colors, sizes, and shapes of the cultural landscape usually symbolize some level of significance regarding societal norms. Spatial dynamics assist in identifying and evaluating cultural differences between places. Traditionally, the field of cartographyThe art and science of map making., or map making, has been a vital discipline for geographers. While cartography continues to be an extremely important part of geography, geographers also look at spatial (space) and temporal (time) relationships between many types of data, including physical landscape types, economies, and human activity. Geography also examines the relationships between and the processes of humans and their physical and cultural environments. Because maps are powerful graphic tools that allow us to illustrate relationships and processes at work in the world, cartography and geographic information systems have become important in modern sciences. Maps are the most common method of illustrating different spatial qualities, and geographers create and use maps to communicate spatial data about the earth’s surface. Geospatial techniquesThe tools used by geographers to illustrate, manage and manipulate spatial data, which can include cartography, GIS, and remote sensing. are tools used by geographers to illustrate, manage, and manipulate spatial data. Cartography is the art and science of making maps, which illustrate data in a spatial form and are invaluable in understanding what is going on at a given place at a given time. Making maps and verifying a location have become more exact with the development of the global positioning system (GPS)System that uses satellite signals to determine exact location on the earth’s surface.. A GPS unit can receive signals from orbiting satellites and calculate an exact location in latitude and longitude, which is helpful for determining where one is located on the earth or for verifying a point on a map. GPS units are standard equipment for many transportation systems and have found their way into products such as cell phones, handheld computers, fish finders, and other mobile equipment. GPS technology is widely implemented in the transport of people, goods, and services around the world. Remote sensingThe acquisition of data about the earth’s surface through aerial photographs taken from airplanes or images created from satellites orbiting the earth. technology acquires data about the earth’s surface through aerial photographs taken from airplanes or images created from satellites orbiting the earth. Remotely sensed images allow geographers to identify, understand, or explain a particular landscape or determine the land use of a place. These images can serve as important components in the cartographic (map-making) process. These technologies provide the means to examine and analyze changes on the earth’s surface caused by natural or human forces. Google Earth is an excellent example of a computer tool that illustrates remotely sensed images of locations on the earth. Geographic information science (GIS)Science (or system) that uses a computer program to sort layers of digital data to create specialized maps focusing on specific topics., often referred to as geographic information systems, uses a computer program to assimilate and manage many layers of map data, which then provide specific information about a given place. GIS data are usually in digital form and arranged in layers. The GIS computer program can sort or analyze layers of data to illustrate a specific feature or activity. GIS programs are used in a wide range of applications, from determining the habitat range of a particular species of bird to mapping the hometowns of university students. GIS specialists often create and analyze geographical information for government agencies or private businesses. They use computer programs to take raw data to develop the information these organizations need for making vital decisions. For example, in business applications, GIS can be used to determine a favorable location for a retail store based on the analysis of spatial data layers such as population distribution, highway or street arrangements, and the locations of similar stores or competitive establishments. GIS can integrate a number of maps into one to help analysts understand a place in relation to their own specific needs. GIS also focuses on storing information about the earth (both cultural and natural) in computer databases that can be retrieved and displayed in the form of specialized maps for specific purposes or analyses. GIS specialists require knowledge about computer and database systems. Over the last two decades, GIS has revolutionized the field of cartography: nearly all cartography is now done with the assistance of GIS software. Additionally, analysis of various cultural and natural phenomena through the use of GIS software and specialized maps is an important part of urban planning and other social and physical sciences. GIS can also refer to techniques used to represent, analyze, and predict spatial relationships between different phenomena. Geography is a much broader field than many people realize. Most people think of area studies as the whole of geography. In reality, geography is the study of the earth, including how human activity has changed it. Geography involves studies that are much broader than simply understanding the shape of the earth’s landforms. Physical geography involves all the planet’s physical systems. Human geography incorporates studies of human culture, spatial relationships, interactions between humans and the environment, and many other areas of research that involve the different subspecialties of geography. Students interested in a career in geography would be well served to learn geospatial techniques and gain skills and experience in GIS and remote sensing, as they are the areas within geography where employment opportunities have grown the most over the past few decades. When identifying a region or location on the earth, the first step is to understand its relative and absolute locations. Relative locationPosition on the earth’s surface with reference to other places. is the location on the earth’s surface with reference to other places, taking into consideration features such as transportation access or terrain. Relative location helps one compare the advantages of one location with those of another. Absolute locationAn exact point on the earth’s surface that can be identified by latitude and longitude., on the other hand, refers to an exact point on the earth’s surface without regard to how that point is related to any other place. Absolute location is vital to the cartographic process and to human activities that require an agreed-upon method of identifying a place or point. Just as you were taught in geometry that there are 360 degrees in a circle or a sphere, the earth also has 360 degrees, and they are measured using a grid pattern called the graticule. 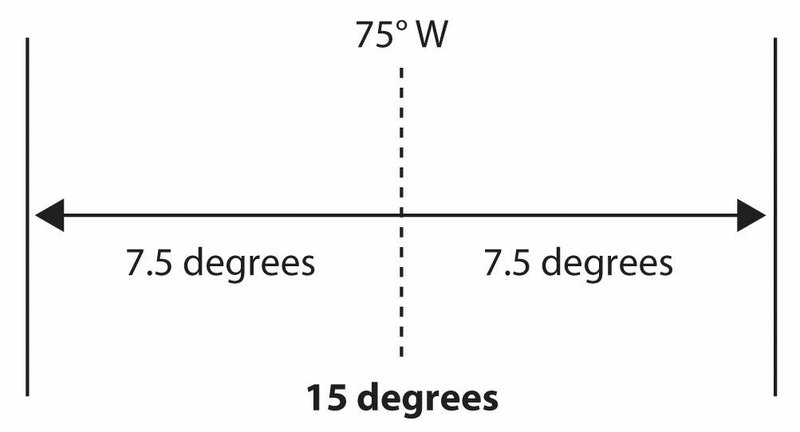 Lines of latitude and longitude allow any absolute location on the earth to have an identifiable address of degrees north or south and east or west, which allows geographers to accurately locate, measure, and study spatial activity. Geographers and cartographers organize locations on the earth using a series of imaginary lines that encircle the globe. The two primary lines are the equator and the prime meridian. From these lines, the systems of longitude and latitude are formed, allowing you to locate yourself anywhere on the planet. The line is the longest when you travel along in an east-west direction. At the equator, the sun is directly overhead at noon on the two equinoxes, which occur in March and September. The equator is the largest circle of latitude on Earth. The equator divides the earth into the Northern and Southern Hemispheres and is called 0 degrees latitude. The other lines of latitude are numbered from 0 to 90 degrees going toward each of the poles. The lines north of the equator toward the North Pole are north latitude, and each of the numbers is followed by the letter “N.” The lines south of the equator toward the South Pole are south latitude, and each of the numbers is followed by the letter “S.” The equator (0 latitude) is the only line of latitude without any letter following the number. 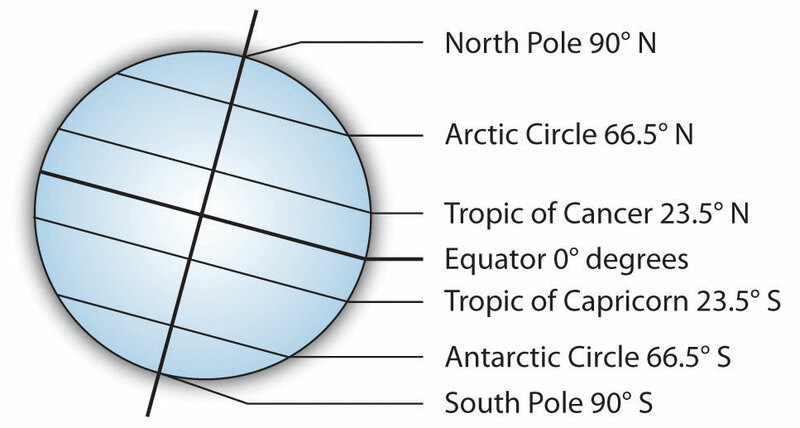 Notice that all lines of latitude are parallel to the equator (they are often called parallels) and that the North Pole equals 90 degrees N and the South Pole equals 90 degrees S. Noted parallels include both the Tropic of Cancer and the Tropic of Capricorn, which are 23.5 degrees from the equator. At 66.5 degrees from the equator are the Arctic Circle and the Antarctic Circle near the North and South Pole, respectively. The prime meridian sits at 0 degrees longitude and divides the earth into the Eastern and Western Hemispheres. The prime meridian is defined as an imaginary line that runs through the Royal Observatory in Greenwich, England, a suburb of London. The Eastern Hemisphere includes the continents of Europe, Asia, and Australia, while the Western Hemisphere includes North and South America. All meridians (lines of longitude) east of the prime meridian (0 and 180) are numbered from 1 to 180 degrees east (E); the lines west of the prime meridian (0 and 180) are numbered from 1 to 180 degrees west (W). The 0 and 180 lines do not have a letter attached to them. The meridian at 180 degrees is called the International Date Line. The International Date Line (180 degrees longitude) is opposite the prime meridian and indicates the start of each day (Monday, Tuesday, etc.). Each day officially starts at 12:01 a.m., at the International Date Line. Do not confuse the International Date Line with the prime meridian (0 longitude). The actual International Date Line does not follow the 180-degree meridian exactly. A number of alterations have been made to the International Date Line to accommodate political agreements to include an island or country on one side of the line or another. The earth is tilted on its axis 23.5 degrees. 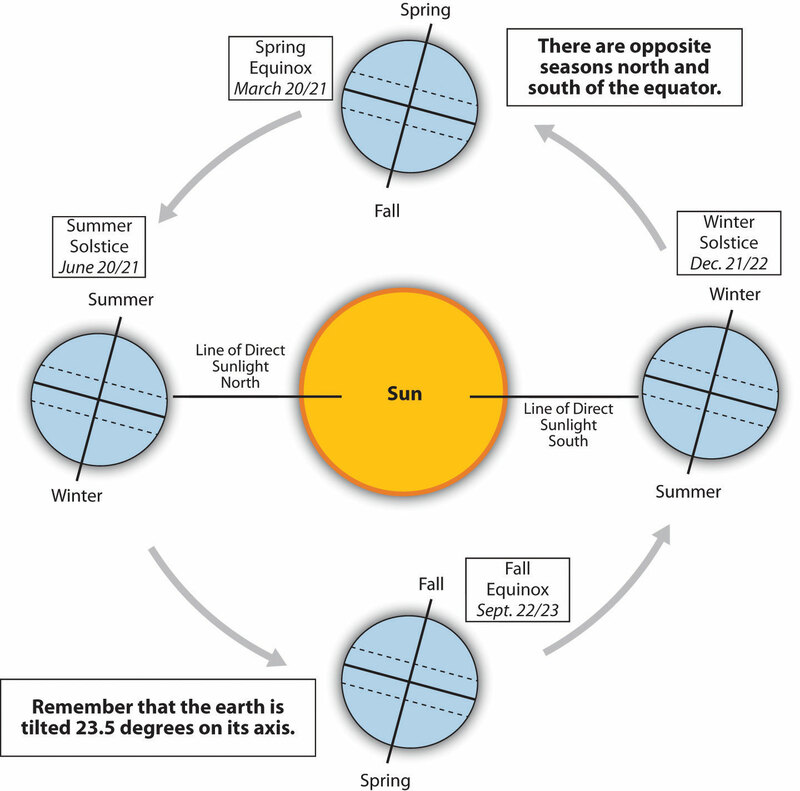 As it rotates around the sun, the tilt of the earth’s axis provides different climatic seasons because of the variations in the angle of direct sunlight on the planet. Places receiving more direct sunlight experience a warmer climate. Elsewhere, the increased angle of incoming solar radiation near the earth’s poles results in more reflected sunlight and thus a cooler climate. The Northern Hemisphere experiences winter when sunlight is reflected off the earth’s surface and less of the sun’s energy is absorbed because of a sharper angle from the sun. 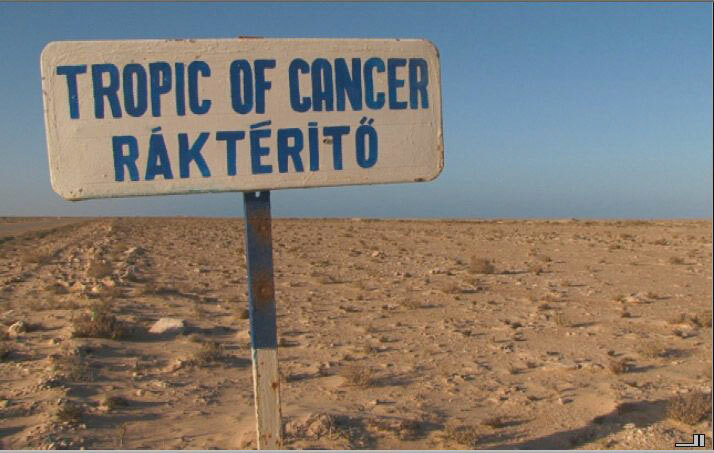 The Tropic of Cancer is the parallel at 23.5 degrees north of the equator, which is the most northerly place on Earth, receiving direct sunlight during the Northern Hemisphere’s summer. Remember that the earth is tilted 23.5 degrees, which accounts for seasonal variations in climate. The Tropic of Capricorn is the parallel at 23.5 degrees south of the equator and is the most southerly location on Earth, receiving direct sunlight during the Southern Hemisphere’s summer. The tropics (Cancer and Capricorn) are the two imaginary lines directly above which the sun shines on the two solsticesTime of the year when the line of direct sunlight is either the farthest north or the farthest south and is directly over either the Tropic of Cancer or the Tropic of Capricorn., which occur on or near June 20 or 21 (summer solstice in the Northern Hemisphere) and December 21 or 22 (winter solstice in the Northern Hemisphere). The sun is directly above the Tropic of Cancer at noon on June 20 or 21, marking the beginning of summer in the Northern Hemisphere and the beginning of winter in the Southern Hemisphere. The sun is directly above the Tropic of Capricorn at noon on December 21 or 22, marking the beginning of winter in the Northern Hemisphere and the beginning of summer in the Southern Hemisphere. Solstices are the extreme ends of the seasons, when the line of direct sunlight is either the farthest north or the farthest south that it ever goes. The region between the Tropics of Cancer and Capricorn is known as the tropics. This area does not experience dramatic seasonal changes because the amount of direct sunlight received does not vary widely. The higher latitudes (north of the Tropic of Cancer and south of the Tropic of Capricorn) experience significant seasonal variation in climate. This sign was placed in this desert location by the Budapest-Bamako rally participants. The non-English portion is in Hungarian because of the European participants in the race. Source: Photo courtesy of Andrew Szabo, http://commons.wikimedia.org/wiki/File:Tropicofcancer.jpg. The Arctic Circle is a line of latitude at 66.5 degrees north. It is the farthest point north that receives sunlight during its winter season (90 N − 23.5 = 66.5 N). During winter, the North Pole is away from the sun and does not receive much sunlight. At times, it is dark for most of the twenty-four-hour day. During the Northern Hemisphere’s summer, the North Pole faces more toward the sun and may receive sunlight for longer portions of the twenty-four-hour day. The Antarctic Circle is the corresponding line of latitude at 66.5 degrees south. It is the farthest location south that receives sunlight during the winter season in the Southern Hemisphere (90 S − 23.5 = 66.5 S). When it is winter in the north, it is summer in the south. The Arctic and Antarctic Circles mark the extremities (southern and northern, respectively) of the polar day (twenty-four-hour sunlit day) and the polar night (twenty-four-hour sunless night). North of the Arctic Circle, the sun is above the horizon for twenty-four continuous hours at least once per year and below the horizon for twenty-four continuous hours at least once per year. This is true also near the Antarctic Circle, but it occurs south of the Antarctic Circle, toward the South Pole. EquinoxesTime of the year in March and September when the line of direct sunlight hits the equator; at this time, days and nights are of equal length., when the line of direct sunlight hits the equator and days and nights are of equal length, occur in the spring and fall on or around March 20 or 21 and September 22 or 23. Source: Image courtesy of R. Berglee. Universal Time (UT), Coordinated Universal Time (UTC), Greenwich Mean Time (GMT), or Zulu Time (Z): all four terms can be defined as local time at 0 degrees longitude, which is the prime meridian (location of Greenwich, England). This is the same time under which many military operations, international radio broadcasts, and air traffic control systems operate worldwide. UTC is set in zero- to twenty-four-hour time periods, as opposed to two twelve-hour time periods (a.m. and p.m.). The designations of a.m. and p.m. are relative to the central meridian: a.m. refers to ante meridiem, or “before noon,” and p.m. refers to post meridiem, or “after noon.” UT, UTC, GMT, and Z all refer to the same twenty-four-hour time system that assists in unifying a common time in regard to global operations. For example, all air flights use the twenty-four-hour time system so the pilots can coordinate flights across time zones and around the world. The earth rotates on its axis once every twenty-four hours at the rate of 15 degrees per hour (15 × 24 = 360). Time zones are established roughly every 15 degrees longitude so that local times correspond to similar hours of day and night. With this system, the sun is generally overhead at noon in every time zone that follows the 15-degree-wide system. The continental United States has four main time zones (see Table 1.1 "Four Main Time Zones in the Continental United States and Their Central Meridians" and Figure 1.7 "Major Time Zones of the World"). The twenty-four times zones are based on the prime meridian in regard to Universal Coordinated Time (UTC), Greenwich Mean Time (GMT), or Zulu Time (Z), which all operate on the twenty-four-hour time clock. 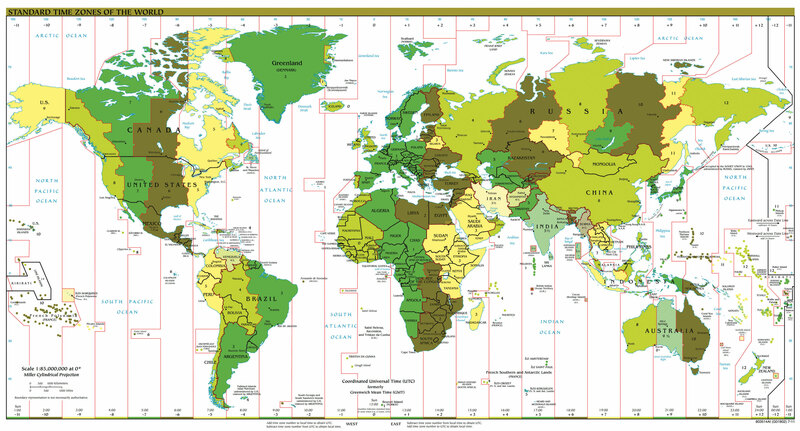 Local time zones are either plus or minus determined by the distance from the prime meridian. In this diagram, 75 W is the central meridian for the eastern standard time zone in the United States. The eastern standard time zone is five hours earlier than the time at the prime meridian (UTC) because it is about 75 degrees west of 0 degrees (5 × 15 = 75). For example, if it is noon in London, then it is 7 a.m. in New York. If it is 1 p.m. in New York, it is 10 a.m. in San Francisco, which is three times zones to the west. Since there are twenty-four hours in a day, there are twenty-four time zones on Earth. Each time zone is 15 degrees wide. A problem with the 15-degree time zones is that the zones do not necessarily follow state, regional, or local boundaries. The result is that time zones are seldom exactly 15 degrees wide and usually have varied boundary lines. In the United States, the boundaries between the different time zones are inconsistent with the lines of longitude; in some cases, time zones zigzag to follow state lines or to keep cities within a single time zone. Other countries address the problem differently. China, for example, is as large in land area as the United States yet operates on only one time zone for the entire country. A region is a basic unit of study in geography—a unit of space characterized by a feature such as a common government, language, political situation, or landform. A region can be a formal country governed by political boundaries, such as France or Canada; a region can be defined by a landform, such as the drainage basin of all the water that flows into the Mississippi River; and a region can even be defined by the area served by a shopping mall. Cultural regions can be defined by similarities in human activities, traditions, or cultural attributes. Geographers use the regional unit to map features of particular interest, and data can be compared between regions to help understand trends, identify patterns, or assist in explaining a particular phenomenon. Regions are traditionally defined by internal characteristics that provide a sense of place. Their boundaries vary with the type of region, whether it is formal, functional, or vernacular; each type has its own meaning and defined purpose. A formal regionArea with specific agreed upon administrative, governmental or political boundaries. has a governmental, administrative, or political boundary and can have political as well as geographic boundaries that are not open to dispute or debate. Formal boundaries can separate states, provinces, or countries from one another. Physical regions can be included within formal boundaries, such as the Rocky Mountains or New England. An official boundary, such as the boundary of a national park, can be considered a formal boundary. School districts, cities, and county governments have formal boundaries. Natural physical geographic features have a huge influence on where political boundaries of formal regions are set. If you look at a world map, you will recognize that many political boundaries are natural features, such as rivers, mountain ranges, and large lakes. For example, between the United States and Mexico, the Rio Grande makes up a portion of the border. Likewise, between Canada and the United States, a major part of the eastern border is along the Saint Lawrence Seaway and the Great Lakes. Alpine mountain ranges in Europe create borders, such as the boundary between Switzerland and Italy. While geographic features can serve as convenient formal borders, political disputes will often flare up in adjacent areas, particularly if valuable natural or cultural resources are found within the geographic features. Oil drilling near the coast of a sovereign country, for example, can cause a dispute between countries about which one has dominion over the oil resources. The exploitation of offshore fisheries can also be disputed. A Neolithic mummy of a man who died in 3300 BCE caused tension between Italy and Switzerland: the body was originally taken to Innsbruck, Switzerland, but when it was determined that the body was found about 90 meters (180 feet) inside the border of Italy, Italian officials laid claim to the body. Functional regionsArea defined by boundaries related to a function. have boundaries related to a practical function within a given area. When the function of an area ends, the functional region ends and its boundaries cease to exist. For example, a functional region can be defined by a newspaper service or delivery area. If the newspaper goes bankrupt, the functional region no longer exists. Church parishes, shopping malls, and business service areas are other examples of functional regions. They function to serve a region and may have established boundaries for limits of the area to which they will provide service. An example of a common service area—that is, a functional region—is the region to which a local pizza shop will deliver. Vernacular regionsLarge area defined by boundaries based on people’s perceptions or thoughts. have loosely defined boundaries based on people’s perceptions or thoughts. Vernacular regions can be fluid—that is, different people may have different opinions about the limits of the regions. Vernacular regions include concepts such as the region called the “Middle East.” Many people have a rough idea of the Middle East’s location but do not know precisely which countries make up the Middle East. Also, in the United States, the terms Midwest or South have many variations. Each individual might have a different idea about the location of the boundaries of the South or the Midwest. Whether the state of Kentucky belongs in the Midwest or in the South might be a matter of individual perception. Similarly, various regions of the United States have been referred to as the Rust Belt, Sun Belt, or Bible Belt without a clear definition of their boundaries. The limit of a vernacular area is more a matter of perception than of any formally agreed-upon criteria. Nevertheless, most people would recognize the general area being discussed when using one of the vernacular terms in a conversation. In comparing one formal political region with another, it is often helpful to use a familiar country, state, province, or political unit as a reference or guide. Wherever you are located, you can research the statistical data for a formal region familiar to you to provide a common reference. The US state of Kentucky is one example that can be used to compare formal political regions. Kentucky ranks close to the middle range of the fifty US states in terms of its population of 4.3 million people. Kentucky is also within the median range of the fifty states in overall physical area. The state’s 40,409-square-mile physical area ranks it thirty-seventh in size in the United States. 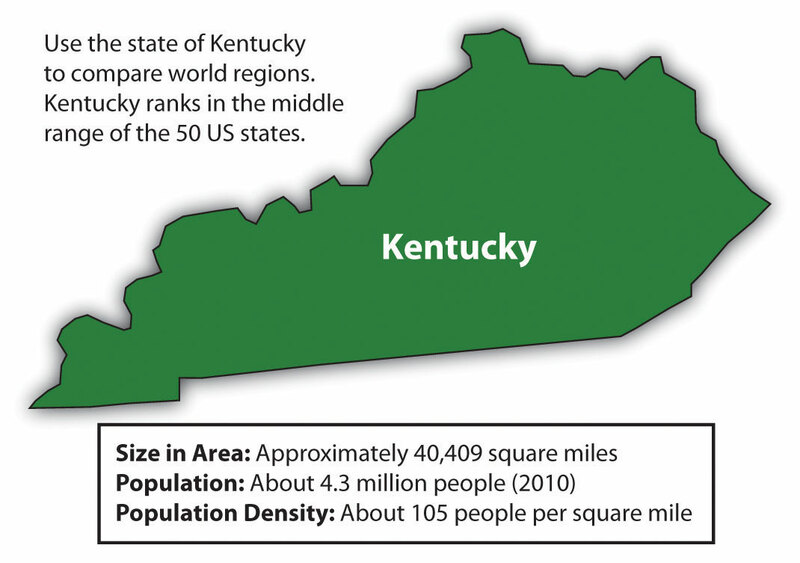 Kentucky is not as large in physical area as the western states but is larger in physical area than many of the eastern states. Kentucky includes part of the rural peripheral region of Appalachia, but the state also has cosmopolitan core urban centers such as Lexington and Louisville. Kentucky also borders the metropolitan city of Cincinnati. The rural peripheral regions of the state are home to agriculture and mining. 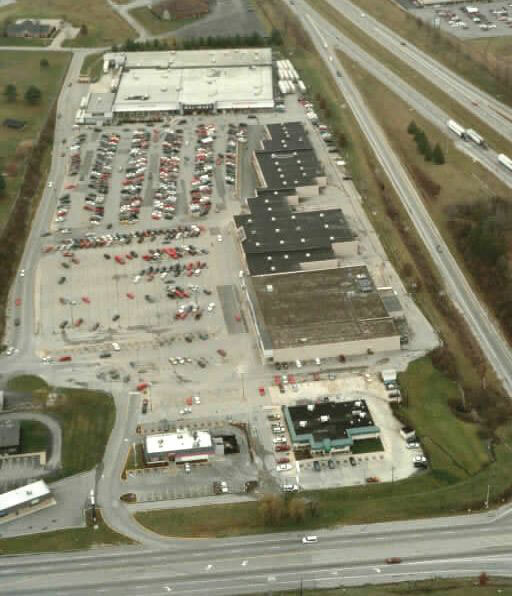 The urban core areas are home to industry and service centers. Other US states could also be used as examples. Identifying a state’s geographical attributes provides readers both in and outside the United States with a comparison indicator for geographic purposes. The state of Kentucky can be used as a comparison guide for understanding other formal political regions around the world. World regional geography studies various world regions as they compare with the rest of the world. Factors for comparison include both the physical and the cultural landscape. The main questions are, Who lives there? What are their lives like? What do they do for a living? Physical factors of significance can include location, climate type, and terrain. Human factors include cultural traditions, ethnicity, language, religion, economics, and politics. 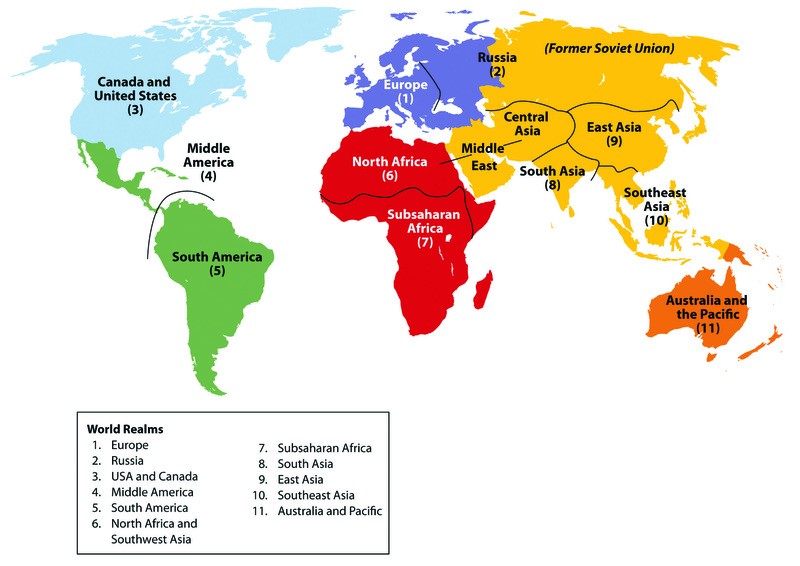 World regional geography focuses on regions of various sizes across the earth’s landscape and aspires to understand the unique character of regions in terms of their natural and cultural attributes. Spatial studies can play an important role in regional geography. The scientific approach can focus on the distribution of cultural and natural phenomena within regions as delimited by various natural and cultural factors. The focus is on the spatial relationships within any field of study, such as regional economics, resource management, regional planning, and landscape ecology. Geography is the spatial study of the earth’s surface. The discipline of geography bridges the social sciences with the physical sciences. The two main branches of geography include physical geography and human geography. GIS, GPS, and remote sensing are tools that geographers use to study the spatial nature of physical and human landscapes. A grid system called the graticule divides the earth by lines of latitude and longitude that allow for the identification of absolute location on the earth’s surface through geometric coordinates measured in degrees. There are twenty-four time zones that are set at 15-degree intervals each and organize time intervals around the world. The tilt of the earth’s axis at 23.5 degrees helps create the earth’s seasonal transitions by either absorbing or reflecting the sun’s energy. The line of direct sunlight always hits the earth between 23.5 degrees north (Tropic of Cancer) and 23.5 degrees south (Tropic of Capricorn), depending on the time of year. A region is the basic unit of study in geography. Three main types of boundaries define a region: formal, functional, and vernacular. World regional geography is the study of a particular group of world regions or realms as each compares with the rest of the world. How does the discipline of geography provide a bridge between the social sciences and the physical sciences? How does the cultural landscape assist in indicating the differences between a wealthy neighborhood and a poverty-stricken neighborhood? How can remote sensing technology assist in determining what people do for a living? What is the significance of the Tropic of Cancer and the Tropic of Capricorn? What occupations depend on knowledge of the seasons for their success? If it is 4 p.m. in San Francisco, what time is it in London, England? How would GIS, GPS, or remote sensing technology be used to evaluate the destruction caused by a tornado in Oklahoma? How is the cultural landscape influenced by the physical landscape? Can you list a formal region, a functional region, and a vernacular region that would include where you live? What methods, topics, or procedures would be helpful to include in the study of world geography? Use Google Earth to locate your current school or residence. Draw a map of your home state or province and include lines of latitude and longitude. Compile the statistical data on your home state, province, or territory to use in comparing formal political regions.